Interfacing at the Movies ? She claims to be a Tailor? ...and Yes, really and truly I am :) While it's true that the focus of my apprenticeship was Shirt-Making, I was instructed quite intensively in both Classic and "Simple" tailoring. Although my lifestyle now is quite casual, there are times that I take a break from Shirt-making for my clients to draft, tailor, and sew jackets and coats for myself. The fabric was completely underlined with Pro-Weft Supreme Medium (exclusive to Fashion Sewing Supply), with 2 layers of it used in the turn-back collar/revers areas, all facings, and the back vent. It gives the perfect amount of support without affecting the luscious fluidity of the cashmere. Of course, the coat is fully lined. Next up in my tailoring plans is a notched-collar blazer jacket, made with this lovely wool tweed and a pattern I drafted myself. I often change my mind about the fabric right before the scissors snip the cloth. But at least I am committed to the pattern! The muslin has been stitched and fitted and I am very happy with the draft. 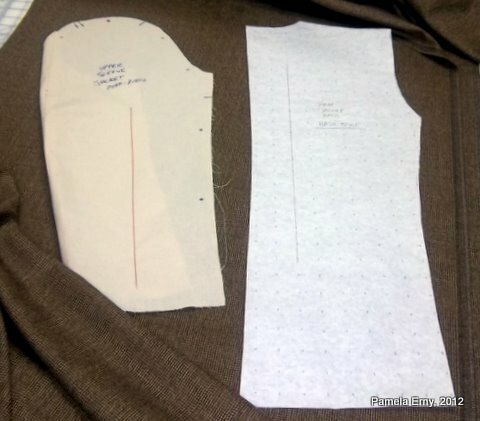 Hopefully I will be able to sneak away from all the action going on at my online store, Fashion Sewing Supply, and at least get the jacket cut-out and interfaced! And I'll try to remember to snap some photos along the way, so you can see my progress. What a gorgeous coat! Stylish, yet timeless . . . you should get many many years of fashionable use out of it!! Gorgeous, classic coat! It will serve you well. I never doubted for a minute that you were an experienced tailor. It shows in your approach to all your sewing endeavors you have shared with us. Would love to see more and learn a few things. Thanks Bunny and Allyn! My goal this year is not only to lose weight and be more healthy...but to "upgrade" my wardrobe. When you live in a semi-rural setting, plus work from home... it's all too easy for me to fall into a "Jeans and a Nice Top" *uniform* habit day after day. Pam, that coat is just beyond gorgeous. I am looking forward to seeing your jacket posts. I'm not surprised you have training as a tailor, either. Beautiful coat! Wish I had one just like it! Your talents are amazing. Gorgeous coat! It's sort of how I envision a camel hair coat I am working on now - thank you for your reply to my comment, BTW. I'm wondering, with your cashmere, how did you fuse the Proweft Supreme Medium without crushing the nap? I'm ready to start testing your Pro-Tairlor Delux but would love your take on how to proceed! What a cozy coat! I will forever sing the praises of your interfacing! Thanks for the info on your use of interfacing cashmere construction. What a stunning coat! Well done! Love the style of your coat...it"s gorgeous. Pam - this is so beautiful. You should be thrilled to have designed and constructed it! Your coat is lovely. Was the pattern drafted using PMB? 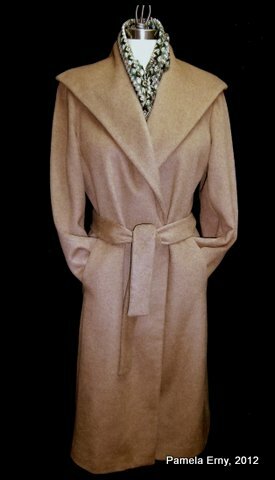 Beautiful coat in a gorgeous, classic fabric. Hi Rosanne, This cashmere coating does not have a deep nap. So I merely covered my pressing surface with a rough towel, and proceeded to fuse the interfacing to the wrong side. Pro-Weft Supreme fuses very easily, so I did *not* need to use heavy pressure to get it to bond completely. Thanks so much, everyone...for your nice comments...I really appreciate them all! Of course the coat is gorgeous and I realy appreciate your explanations about how you interfaced it. Pam, thank you so much for your sweet comment you left on my blog today regarding my baby Samantha and for your prayers and encouragement. Your coat is fabulous. I really love the style. I guess this is another interfacing for me to need to buy. I will have to get over my fear of cutting into cashmere. I would have the same fear I had cutting into my wedding gown lace 26 years ago! Dale...sorry I haven't answered your question until now! During the 80's, I had the opportunity to apprentice with a wonderful "Old World" Master Tailor who also embraced modern techniques. Sadly, he is with us no more. I studied with him for nearly 6 years (for 5 hours every weekday and for twice that every Saturday and most Sundays)...all while working my "day job" in the pharmaceutical industry (the career that paid the bills ;) It was quite a balancing act!